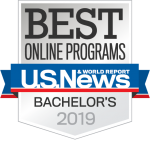 January 15, 2019 – SEATTLE – U.S. News & World Report announced its annual rankings of the Best Online Bachelor’s Programs and City University of Seattle was ranked among the best in the nation for the seventh consecutive year, placing at 33. In addition, CityU was the only private university in Washington State ranked in the top 50 this year. The list of Best Online Bachelor’s Programs is developed to help prospective students see which schools may be right for them. According to U.S. News & World Report’s ranking methodology, the majority of students in this ranking are working professionals in their 20s to 40s looking to advance in or change their careers. This directly aligns with CityU’s primary focus of serving working adults and transfer students. City University of Seattle has a history of developing innovative education practices to meet the needs of its students, and is committed to helping them complete their programs. The university offers online bachelor’s degrees in subjects including management, cybersecurity, applied psychology, and project management. CityU’s consistent top 50 ranking among the best online bachelor’s programs affirms the university’s efforts of providing the best student experience possible. The university was also ranked #28 in the nation for the Best Online Information Technology Programs. In addition to the online bachelor’s programs, CityU was ranked in U.S. News & World Report’s Best Online MBA Programs for the fifth consecutive year. The MBA is one of the most popular degree programs the university offers, and this ranking underscores that success. You can view the complete list of Best Online Programs and the methodologies on the U.S. News & World Report website. City University of Seattle is a private, nonprofit university dedicated to serving working adults and transfer students. The university is accredited by the Northwest Commission on Colleges and Universities through the doctoral level and offers more than 60 online, onsite and performance-based programs. CityU’s primary campus is located in downtown Seattle, Washington, and the university has multiple sites throughout Western Washington, Canada and abroad.